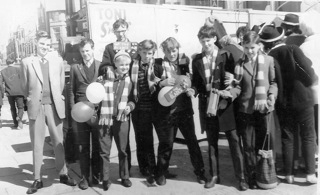 Sheffield United Supporters Club trip 1963. See note below. Photo courtesy of John Jennings. Killamarsh Branch of Sheffield United Supporters Club trip to Blackpool on 24th August 1963. The match ended up 2-2. Left to right: John Mallender, David Baunforth, John Jennings (at back), David Mantle, Terry Adair, Ray Godber, Pete Purdy, Peter Darker.